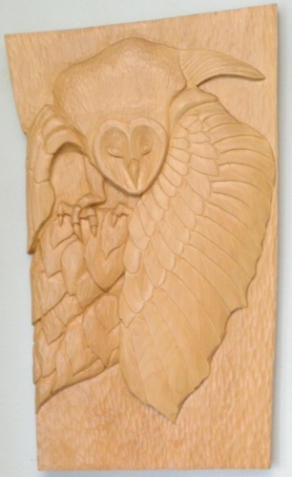 Relief Carver Wojtek Tosik begins his work with a design idea, usually put to paper in the form of a master pattern which is then transferred to the wood surface. Tosik’s process involves removing wood, using gouges and hand tools, from a flat wood panel in such a way that the subject appears to rise out of the wood. My name is WT. I always wanted to carve wood. My Grandmother awakened my interest in art, making me sculptures and drawings when I spent time with her as a small boy. I moved to Alaska in 1995. The Natural beauty of the place inspired me to carve. In Alaska, I was fascinated by the native Northwest Art which still influences me greatly. I began study at the University of Southeast Alaska. The spirit of nature is my greatest teacher and I do my best to express this in my work. Traveling is my passion. I have lived in many places but the Oregon Coast is my favorite place and I now feel privileged to call Port Orford my home. Currently I have carvings in the Hoonan art Gallery, Hoonan Alaska, Fairweed Gallery, Homer Alaska and several galleries in Sitka including Sitka Rose Gallery, Fisherman’s Eye Gallery, Fair Weather Gallery, Tlingit Indian culture Center and the Sitka Airport. I also have work in the Cook Gallery, Port Orford, Oregon. My work can be found in homes in Poland, Germany, Austria, Taiwan, South Africa, Canada and the USA. Prices above, do not include packing or shipping cost. Cook Gallery can accept Pay Pal as payment for online orders. Pay Pal is the most secure way to pay for online purchases. When a purchase is made, we will send you a secure invoice. If you don’t already have a Pay Pal account , follow the links on the invoice to easily and safely set up an account. Click Here To Contact Rick Cook or call 541-332-0045, 9 am to 4 pm, Pacific Coast time, Monday thru Saturday. We respond to all e-mails. On occasion Spam filters, yours or ours, have blocked queries and responses. If you don’t get an answer, this is most likely the reason.